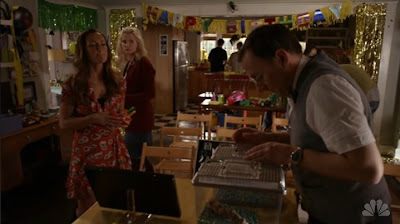 I love this Kate Moss for Topshop dress that Minka Kelly is wearing on a recent episode of Parenthood ("Amazing Andy and His Wonderful World of Bugs" episode). Unfortunately, it's sold out except for eBay where it is going for outrageous amounts of money. (Photo credit/Photo credit) Sorry for the second photo being so bad, it's a screencap that I took off Hulu and it was the best I could do. It's kind of hard to see but she paired her dress with a pair of knee high black boots. 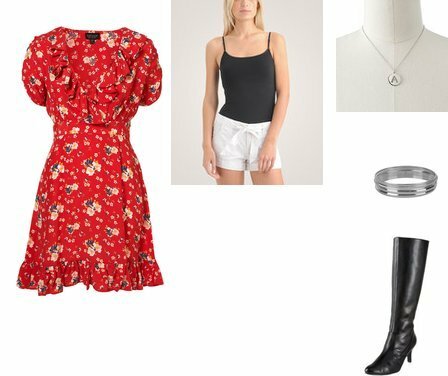 I put together a similar look with another Topshop dress (limited sizes available, unfortunately), and you can click on any of the images below for more information!